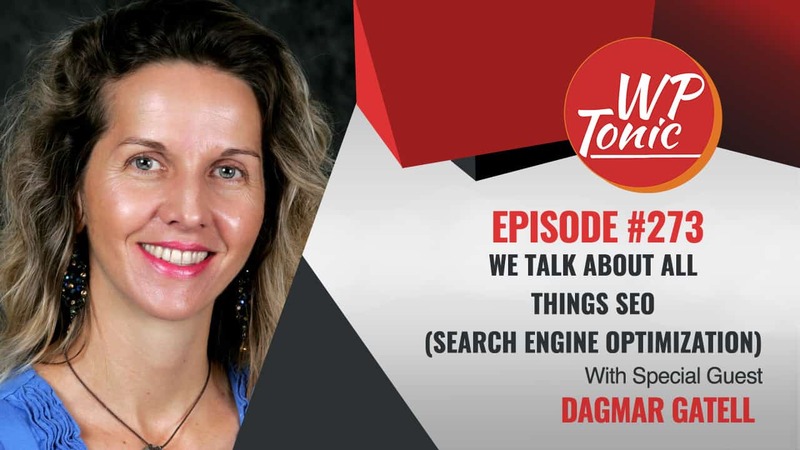 This week, SEO and Inbound Strategist Dagmar Gatell (dagmargatell.com) joined co-host Kim Shivler for episode 273 of the WP-Tonic Wednesday show to talk about SEO (Search Engine Optimization) and the things that you may not know are affecting your rankings. While many think of SEO mainly in terms of keywords and backlinks, this discussion delved into other areas such as the importance of having pages load quickly and making sure that you are actually being found within the context you want to be known for. Keywords used out of context could bring you traffic you aren’t looking for causing quick bounces which can hurt your rankings. We also spoke of the importance of having your business listings if you are a local business and making sure you are found in voice searches. Dagmar Gatell is an internationally respected SEO consultant, Inbound Marketing consultant, coach and strategist. She is uniquely able and qualified to uncover profitable niche markets in places most entrepreneurs never consider. 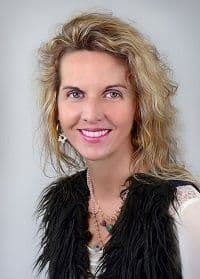 Dagmar uses her knowledge, expertise and instinct to create cutting-edge, targeted solutions to help you attract the right customers, convert leads and grow your business. Her SEO expertise is especially appreciated by her clients when creating demand and lead generating websites and online social presence. Kim: Hey everybody. Welcome back to the WP-Tonic podcast. I’m co-host Kim Shivler who’s taking the role of Jonathan Denwood today. Jonathan’s taking a very needed vacation day and we are here on episode 273 with my good good friend and guest Dagmar Gatell. Dagmar is an SEO expert beyond experts. She is someone who knows more than anything I’ve ever heard anyone talk about and that’s something we’re going to dig into today are things you probably don’t know are affecting your SEO. Dagmar, tell us a little more about yourself. Dagmar: Thank you for having me today Kim. What I learned the last 2 years, I do SEO since the last 10 years, inbound marketing, I’m really not an expert, I’m a practitioner because I learn new things every day. So whenever I think have something together, there’s a Google change or there’s something else going on and then you test it, you tweak it and you execute it again and again so it’s really interesting. My background is, I love SEO totally and I enjoy building authority websites for experts or coaches or trainers or speakers who want to be seen globally, who have a message or have a purpose, want to create a change, want to make a difference in the lives of others or for the world or for all living beings. And what I found out on my journey that a lot of times people see SEO as the Search Engine language and it’s so dry and they don’t want really to deal with it. Where in reality, it’s really the searcher who creates the language. So to connect with the searcher, SEO is just the bridge to it. Kim: Excellent. Thank you for that. I’m excited to see what we dig into. Our sponsor for today’s show everybody is Kinsta Hosting. Your web hosting does matter. Kinsta is the host for the WP-Tonice website and we highly recommend their WordPress managed hosting focused just on your WordPress website. You’ll see all the more information about Kinsta Hosting in the show notes and in the information on the program. Now, let’s get into the meat of this. Dagmar, you mentioned one thing about search and searchers etcetera but sometimes I think that that’s all people think of SEO is, is just searching for keywords, finding the right words to reach your audience. And yet, I learned from you that it’s so much more than that. Dagmar: Like today, right, today I did a competitive analysis and a niche research before I came onboard and it’s clearly SEO is where your money is online. 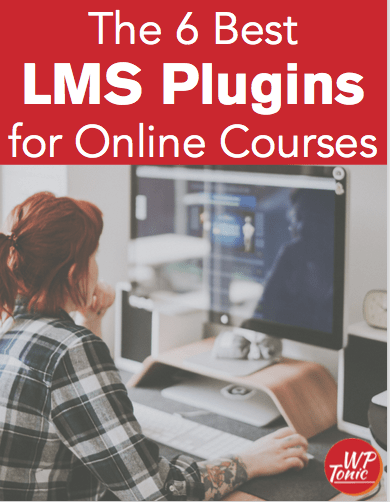 And I thought about what I can bring to the table today to enrich your listeners where I know you and Jonathan are going the direction, membership websites and WordPress LMS. So it’s really important before you go online, have an online presence, have membership sites, think about online training courses, that you do your market research because there’s money in niches and they’re just educational niches where there’s no money in. So to build a website or a blog or an online training course or a membership site, if there’s no money in a niche and people are just looking for freebies, right? They’re looking for how to do things, what is, like free YouTube information, free content online. You can never make money with that and I had clients like that and I think you had clients like that Kim. They created content content content content on an ongoing base and were so proud of themselves and they did not make money. Doing market research from the beginning so that you really have a good understanding, not only what people search for but what is it that people are willing to pay for is priceless. Kim: And how do you find out what people are willing to pay for? We’ve heard a lot about, I think, search tools and finding what people are searching for but how do I know that next step? Are they willing to pay for it or are they just looking for free YouTube videos? Dagmar: So, there are many free keyword research tools, right? So, there are paid ones. I love SEMRush because it’s a great professional one but not everybody can afford it. So the best way to start is just search for free keyword research tools. You first need to write down for your online product or for your membership site or for your blog or your website, what is it you want to be found for? What is it you is it you want to be in authority in? What is your expertise? What is your knowledge in? So make a list of all these things. Then, when you go into the free keyword research tool, then you search for the specific word. Then, you can see what is the monthly search demand for it but you also see the cost per click. So the cost per click is an indication that for this keyword, there is a profitability online. Most of the time how to keywords of what is, whatever, SEO, what is south development, normally has no keyword profitability. So if none of your competitors are bidding for this keyword online, it’s a clear signal there’s no money to make. So you really want to clearly have a good amount of commercial keywords. Commercial keywords are the ones who bring you the money and you can have educational keywords and create content for that to create like a bigger amount of traffic because a lot of the educational keywords, the how to or what is, they have a huge search demand. Just in mind when you bring them to your membership site, online training course, website or blog, you need to have a tool there to at least collect their name and email address so that you can convert them deeper into your paid product or services. Kim: Okay. So there is some value then for that higher traffic for my SEO even if they’re not buying everything I want them to buy. Dagmar: Absolutely. When you do membership and online courses, there is content people want to find and there’s content people need to solve a problem. So what we know from an online marketing perspective, you need to pick up people where they are and bring them where you know they need to be and it’s the same with keywords. It’s very interesting to think about there’s always an intent behind the keyword, right? And when we just see what somebody types in, we could miss that easily. If somebody types in, they’re looking for a cleaning spray to clean up dog poop or clean up marks your cat or your dog left in your carpet. So if we just would look at that, then we would totally focus on this cleaning spray. So we would assume they’re looking for a spray to take care of the little accident. Where in reality, oftentimes they’re looking for a solution and they’re totally open-minded. It can be a cleaning spray. It can be something totally natural. It can be something how to prevent these little accidents. So it’s really important to understand what is somebody looking for. So if they’re looking for how to content, does not mean they don’t buy. So it just means they’re looking for the solution they need right now. So if they’re looking for how to clean up dog poop or how to clean up, what is that, marks your dogs or cats left in your carpet, then within the content, you still have the chance to lead them to your commercial content, to the content where you can convert them into your product and services. Kim: Okay. Or perhaps to that spray, to purchasing that spray, right? Kim: Let’s think of cat hairballs. That’s one that I have to deal with an awful lot. They make a big mess. So you’re bringing them there with the free content, that how to but then the bottom line is you’re trying to sell them that product that cleans it better than anything else out there. Dagmar: Yeah. Let me just say, you want to provide them solutions. So it’s very very good to put ourselves out of the picture because, you and I totally know we’re not for ourselves online, we’re online for our clients, for our customers, for our tribe, for our. So whatever they need, we provide. So it’s really not about selling something. It’s really totally the focus of what is their question and what is the solution I can provide. And it really doesn’t matter if it’s an online training course, it’s still, why would they take an online training course? Because they have an issue, they have a need, they have a problem. So they’re looking for the problem. They’re not, perhaps not at all aware of that your online training course exists. So you need to pick them up where they are and then little by little bring them over the bride that they have come aware of. Kim: Thank you. So we know we have keywords, we know we have to research the market to make sure we have a market that is profitable at all, if that’s our goal to be profitable and not just have a hobby. But then there’s other things that can affect that SEO also, correct? Like page speed. How important is that? Dagmar: Page speed in 2018 is totally important, right? And it’s not so much what Google dictates but what the user needs. So if you think about our mobile devices depending on what area we’re in, that page is loading fast is crucial. Because if the page is not loading fast, then the searcher will go to another website. They’re not waiting like, I think, isn’t that 6 seconds attention span of a goldfish? So they are not waiting. So really making sure and Google has this free tester for the page speed. So you can search for Google speed, I think it’s tester and then you can test each page of your website. And a lot of times, that’s Kim’s specialty and a lot of times you can see what can be done and if you don’t have the knowledge to do it, it’s really valuable and worth hiring an expert to take care of that. Because if your page takes forever to load because of the images, because it’s not caching right, because of, whatever, the code on it so then you lose immediately. And when somebody comes to your website on their mobile and bounces out immediately, meaning they leave the website immediately as soon as they arrive, it’s a negative signal for the search engines. So they really see it, if you don’t provide what you promise in the first place, so then it also affects your rankings and you can lose your rankings in this way. And I think it all comes down to now Google is indexing mobile first. So having that in mind, everything needs to be quick and fast, easy navigation, the user experience needs to be great and it really doesn’t matter if you have a website or a membership site or an online training course, the expectation is the same, right Kim? Kim: Absolutely. Most people I think understand it from a usability standpoint. There is nothing worse when I’m looking for a business online, I’m in the car, I need to get there and you can’t get to the site. It doesn’t load or it’s not responsive etcetera. You can’t see it on the phone. And yet, people need to understand that the search engines are also taking notice of that. When people are bouncing right away, they know that you’re not providing what you need to provide and then they’re going to affect your rankings with that. Dagmar: Let me just say something. For the listeners who are not technical. You go to a supermarket and you look for somebody who can help you and you found somebody and you ask them a question and they cannot give you an answer. They stay in front of you and they think and think and think and think and think about the answer and you get impatient. You think, “Are you kidding me? How much longer should I wait? I thought you were a professional here. I thought you have experts here”. So then, what would you do after a few minutes? How are you willing to stay with this person thinking about the answer? That’s the same with any website loading any website load time online, right? Because that’s at the end the same feeling we get. We don’t feel respected. We don’t feel really appreciated as a client. We don’t feel taken serious. I have clients and they just see the website or the online presence as something else they have to take care of. Where in reality, it’s us. If people come to your website, they see your website as you, how respectful you are to them, how polite you are to them, how you’re willing to help. If they cannot find what they’re looking for or it loads forever, they feel like you do not take the effort and time to please them so why should they stay with you. Kim: Excellent. Any other trends that you’re seeing that are going to be really important for 2018? We’re still at the beginning. So, what should we be focusing on, on our sites? Dagmar: If you are a local site, then for sure voice search is something you want to have in mind. So the trend is going into, it’s not there yet but for sure with the millenniums, it will come, that’s it’s voice search. And if somebody’s looking a dentist in Miami, they just say “Dentist Miami”, and the search engines, especially Google, will perhaps only bring one result. They’ve already minimized from 10 results to 3 results on the local listing pages, where the local companies are shown. So by having that in mind, what the opportunity behind that is you can use your website, your membership site or your online training course as a data source. So there will be no low quality, weak websites anymore who can’t perform well if the front search is limited to less and less keywords. So you have to provide more content and more resources in the backend of your website to balance that out, to even that out. And the other thing is, well, I totally see coming and a lot of speaking about it and the big companies already have it implemented. The small business owners don’t have it because it’s tricky and it’s time intensive and it costs money but it’s totally beneficial. The AMPs, Accelerated Mobile Pages, which breaks your content down in really small digestible bites and speeds your website up like as a shuttle, like a rocket. But the downside is because it minimizes so much that it’s not easy to find plugins for your forms or for your opt-ins, things like that. But this is for sure something you want to have in mind next to the load time of your website and of your pages. Kim: And on the voice, where you said your voice search, is there something special technically people need to have in mind to do that or does it just mean you’re writing your very clear content because the search engines still understand it, they’re just going to understand it from someone asking from a vocal perspective as opposed to typing it in? Dagmar: So it’s the SEO part that’s really on your website you have to do a better job if you have a blog on your online training course or membership site. From a technical perspective, if you’re a local business, what it means if only one company comes up, the assumption is that Google will go totally into page search and taking the results for the local companies from the page search. So you want to be prepared to have the funding to invest in page search, to invest in Google AdWords if you have a local company and that your company is coming up. And also that you have the funding to invest to beef up your Google My Business page because the knowledge base on your Google Business page, you have your phone number, your address, the pictures you can upload, you can do promotional posts for free, you do messaging for free, so you really want to take advantage of all the free features in your Google My Business Listing to even out that less and less businesses are shown on the SERPs, on the Search Engine Results Pages for local. Kim: Okay. That’s the first time I’ve heard people say local businesses may want to start thinking of that budget for some paid advertising. Dagmar: Page advertising. Yeah. The think about it, right? So we had 10, now we have 3. The trend will go, local businesses will have to pay for advertising if they are advertising Facebook, if they’re advertising in Google. Because the difference, right, online training course and membership sites, you have a bigger niche and then you break down to the sub-niches. Locating listing, “Dentist Miami”. So they are really not many core keywords. So you can “Dentist in Miami”, “Dentists in Miami”, “Miami Dentist”, “Miami Dentists”, but there are not many variations if you’re just a simple Dentist in Miami. I did a competitive analysis this morning for a branding company in New York. They have huge amounts of variations because they’re a branding company, they’re a design company, they’re a digital marketing company. So the more your company is spread in different sections, so more options you have to rank well and get reach well with both social media and SEO and inbound marketing. But if you have a very very specific occupation, then you will have to do paid advertising to really compete in your local area. Kim: Right. This is really great information. We’re going to come back because she’s just given me more questions to ask. But first we’re going to take a quick break and we’ll be back in a second. Kim: Welcome back everybody. I am talking to Dagmar Gatell today. We are talking about things that affect our SEO. Some of these may be things we haven’t even thought of. We started with keywords and niches that a lot of people, you hear people talk about. But then we’ve dug down with things like page speed and voice search for local businesses. So let’s talk a little bit more about local businesses before we go back to the broader topic. Kim: You mentioned your Google Business page. Now, that is free, correct? As opposed to the advertising. Is that what shows up when, for example, you look on Google maps, is that what we’re talking about? Or what exactly is that Google Business page? Dagmar: So, for example, when you search “Dentist in Miami”, then you see on the left side normally first, the paid advertising, then you see the local listings what Google brings in, before was 10, now is 3. And then, on the right side, a lot of times is shown, when you search for a specific company, is shown the company’s, Google My Business profile. So every company with an official business name, business address, and phone number can create their own local listing in Google but also Bing, Bing has the same, Bing for local. So you want to have as many local listings as possible. And MOZ, M – O – Z, has a great free tool where you can see your own local listings. Is it displayed right? Do you use the same address everywhere? Do you use the same phone number everywhere, the same website, the same spelling of your business name? Because the key for local is consistency. So you really need to show the serious, I think that’s the right English word, serious that you take that serious to have the same information everywhere. And what happens, a lot of the local listings like Yellow Pages or White Pages or I think Super Pages, so they will pull in your business name wherever they find it. So if you have it incorrect on your website and they pull it in, you need to go back and correct it. So they really can make sure it’s right everywhere. Kim: Okay. So we have some follow-up work to do with this business. And I like that you pointed out a business name, number, address, this is really where you want to have a real address, not every once in a while I look up a business, it’s showing somebody’s house. Dagmar: Believe it or not you can go and get, what’s the English word for that Kim? You can a P.O. Box if that’s recognized as a street. So the USPS offers that service. So you could go to the USPS and get a street number there and if you’re a home-based business, how you can set it up, you set up your Google My Business page and there is a checkbox where you can check if you want to have this address being seen visible on. So you could use your home address. The only downside is if you would hide it on your Google My Business page and hide it on your website, what I see from my experience, it affects your ranking for the local business. So what I would do, I would make it public with the street name on the Google My Business and Bing for local and then put the same address on your website. Kim: So it can be one of the mailbox places, that type of thing. Dagmar: It just needs to be recognized as a street. So it needs to be recognized as an official address. Dagmar: It cannot just be a simple P.O. but the USPS offers that service. Kim: They do? Okay. I didn’t know that. I know for certain things you cannot use a P.O. Box. but I didn’t know they had a suite service for streets. Kim: Excellent. Thank you for that. We will try to get that or I will get Daggie to help me find that MOZ link for that tool and we can put them in the show notes. Wow. Lots of stuff here. Let’s get back then to some other things with our more online businesses. So one of the things I’ve learned from you over the years is that there are different strategies. There’s a local strategy that we’ve just talked about. But then, if you’re going for that, for example, my online training courses, which are not usually local people, they’re people from all over, my strategy is going to be a little bit different or maybe a lot different. Is there any value from a Google perspective, I have my own thoughts on from a business perspective. from a search engine perspective to still have that local aspect to your business even when you’ve got both sides, you’ve got local as well as this big, bigger online? Dagmar: Yes, if you have an online training course, you don’t need to have the local business. You just can sell your online training course. So there are two aspects what I see is very beneficial. The one aspect is you get the local rankings which help you just improve the value and the quality of how your website is seen for the search engines. Every backlink helps. Every ranking helps because it will bring people still from the local area to your site. They will stay on your site. And the longer they stay, the more they read, the more beneficial it is. So, yes, it is beneficial to have an address on your online training course. The other thing is what I see it has a lot to do with credibility and trust if you have an address on your online training course because that makes you seen as more accountable without any questions. Because if not, everybody can set up a spam online training course from everywhere in the world and charge you $50 for the promised online training course and you never get it. And then you figure out, the company is not here, the company is, whatever, anywhere in the world, perhaps in Germany. Who knows, right? Try to hunt them, get your money back if they are not in the United States. So for sure having an official business selling this product is great. And then what’s coming more and more and I can see it when I do the audits, the content audits, the branded keyword wins more and more on value. A few years, if you used your business name in the metas, in the title or meta description, this is where the search engines look what is your page all about. It’s a, normally comes in from the SEO Yoast plugin or All in One SEO, that’s where you fill it out on your website, online training course, membership site. Well, what it really didn’t do years ago, if your company wasn’t known well, you could skip it. It had really no value. If you were not Tony Robbins or Oprah or Dr. Oz, then forget it. Now, it creates a credibility for your company because it connects your core keywords to your company name. So let’s say the Dentist in Miami, his name is, whatever, Dr. Smile or Dr. Sunshine, if people search for “Dr. Smile Dentist Miami”, it will increase how Google sees you from a ranking perspective, trust and credibility and it will push your rankings. Kim: And that’s specifically company name, not your personal name, correct? Unless, again, you’re a celebrity? Dagmar: Right. Or like you and I. So we brand us, not only with our company name but also with our personal name. So it’s a branding thing. It’s not an official business name. Dagmar: It’s really, you connect the branded keyword to the topic related keyword. So the branded keyword is what people need to know, your name, your business name and the other one is what people search for. So that brings you additional authority and recognition. Kim: Wow. I know that’s one I bet a lot of people haven’t heard. This is one that you and I just recently talked about. Dagmar: It’s not old. It really developed over the years and from the audits, I see it coming in. So it’s true that Google really gives recognition if you have your branded keyword and your topic related keyword searched by people. If they search for people, like for you,”Kim Shivler Online Training courses” or “Kim Shivler Membership sites” or “Kim Shivler Speaker Training”, that helps you for your Kim Shivler website in your rankings. Kim: Thank you. This has been a great major show. We’re going to wrap up in just a minute for the main show but then Dagmar’s going to come back and share another 10 minutes or so of really valuable extra content that you will be able to see on the website or the YouTube channel. So before we wrap up with that Dagmar, why don’t you tell everyone, one, where they can get in touch with you and two, a little bit more. You’ve thrown out several times today about doing a content audit. What exactly does that mean and why would somebody want to have that done? Dagmar: Okay. I’m sorry thoughts were already running. You asked me how people can connect with me, right? Dagmar: I already thought about the audit. So the best is, you can go to my website dagmargatell.com, d – a – g – m – a – r – g – a – t – e – l – l .com or you send me an email at [email protected] So doing a content audit, I love it because it separates what we think we are seen for to what are we really seen for. This is the absolute perfect example. I just love it because it’s so. So years ago I had a family therapist and she came to me and she wrote blog posts every other day and she had a huge website, huge huge website but she did not have the recognition for what she wanted to have the recognition for, family therapy and it was for South Florida. So I did the content audit and she was highly ranked, highly ranked for cheating husbands. So if people were looking for cheating husbands or to find cheating husbands or to become a cheating husband, her website came up. And it was because in every blog post, she referred to cheating husbands. So because of this consistency, and she just did it subconsciously, Google thought she is the authority for cheating husbands. And as I told you beside yourself. I think she had like 500 blog posts written. So we had to go through all of them and make sure the content is cleaned up. So that’s a funny example but it clearly shows what we think is not reality. So a content audit looks a the perspective from Semantic SEO. So Semantic SEO is like, for example, when you think of the word, let me just think of a good, cars, right, like in auto, cars. So, cars can be an auto you buy at a car dealer. So a car dealer website would be about cars, buying and selling cars and maintenance, car maintenance, car repair. So you have these related keywords, the trigger words around your core keyword cars. So the search engines clearly understand the car dealer. So then, there’s the movie Cars from Disney. So then, you have the website about the movie, you have perhaps movie, perhaps you have ticket sales, perhaps you have a review. So you have really related things to this specific core keyword. And then, there’s also an association, which is CARS, has nothing to do with cars. So the content audit really helps the website owner or the blog owner or the online training or membership site owner to understand how the search engines see the site and then to tweak it and to improve it so you get to the point where you really want to be seen for. I hope that makes sense. Kim: Makes perfect sense. Thank you. We are going to wrap up the main portion of the show. As Dagmar said, you can find her at dagmargatell.com. It will be in the show notes. Of course, you can find us at WP-Tonic.com. That’s the website where you’ll find all the show notes and if you want to contact me personally or find out what I’m doing, you can find it all on kimshivler.com. I hope you’ll join us on the website or YouTube so we can see the rest as we come back and talk about accidentally being found for cheating husbands.